Here's the deal ... 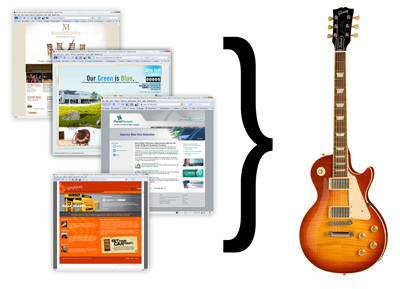 I will build you a ColdFusion + Mura CMS powered web site and all you have to do is buy me a guitar. Now, not just any guitar of course! One guitar in particular that's been on my wish list is a Gibson Les Paul. If you have one, or something of similar value, let me know! I'm sure we can work something out. Need to see some of my recent work? No problem. I've blogged about several of my web site projects. Inspired by Kyle MacDonald and his "one red paperclip," I'm sure somebody out there needs a quality-built web site that they can have full editing capabilities of and is willing to make a trade. Nice. I've done this before. Actually have done a web site for a guitar... actually 2 baby Taylors. Les Paul is a nice choice and what... running 2-3k now days. Still, it's a good deal you are throwing out there. My latest pitch was 1 CF/CMS website for a steel drum. Wrote several letters to a few companies in Trinidad/Tobago, but alas, they don't need/value a stinking website. Steel drums RULE and I still want one. Good luck. Sorry the steel drums haven't worked out yet. Keep the faith! No doubt, you've re-kindled my spirit and I recently twittered... "Will give you a web site for a steelpan! :) Last time I wrote letters, Twitter was still unknown. I did a bunch of work to get my PRS Custom haha. Good luck man! Thanks man! Hey, if someone would offer me a PRS Custom, I wouldn't turn them away! I just know there are so many guitars out there in closets, under beds, etc. that haven't been touched in eons ... hopefully someone will stumble across this and contact me. I'll be sure to let everyone know about it too! There is a guy in New Hampshire that makes Steel Drums. He trained in Trinidad. Might be worth a shot!! Thank you very much for this wonderful site well written and informative content you have. Great job, I have got interesting points and methods here after reading this hypnosis-down under blog,keep it up. Guitar is an excellent gift to give to your partner on valentines day, just got an idea after seeing this post lol.